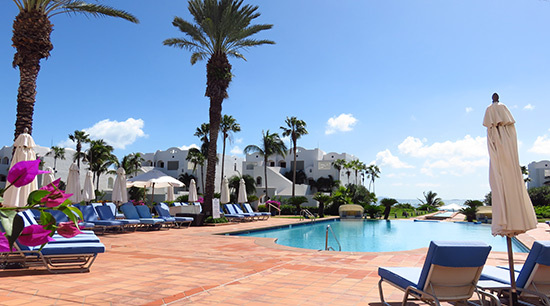 Update 2019: CuisinArt Golf Resort & Spa re-opens after 14 months of grand renovations. 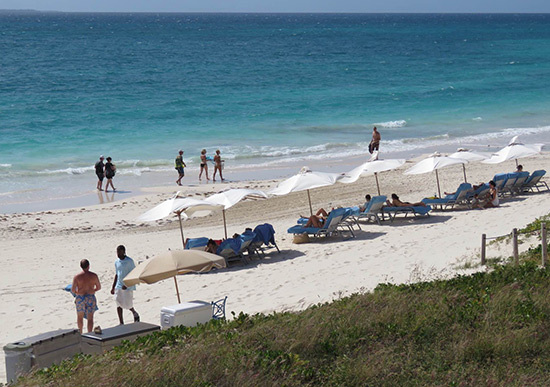 More on the NEW CuisinArt Golf Resort & Spa here. 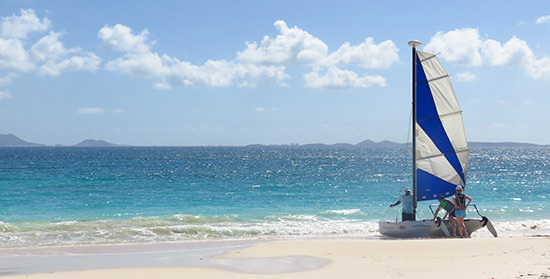 Set on the sparkling, smooth crescent beach that is Rendezvous Bay, amidst swaying royal palms and blossoming bougainvillea, CuisinArt Golf Resort & Spa surpasses the term "Anguilla luxury resorts." 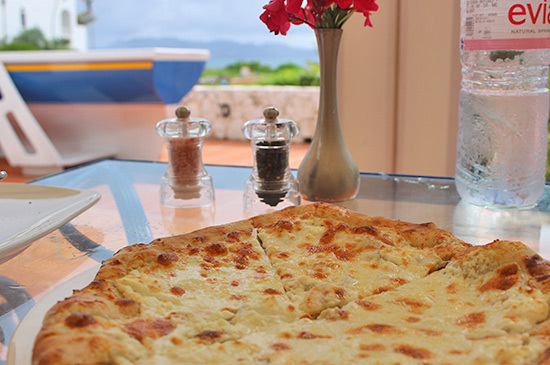 It not only leads the way in resort dining, it offers some of the top restaurants in all of Anguilla. Executive Chef Jasper Schneider conducts the culinary renaissance with a fine attention to detail, right down to the fresh produce sourced daily from their on-site hydroponic gardens. It rounds out its world class offerings with two more award winners, the Greg Norman designed golf course and the Spa by CuisinArt. Wrap that all up with the consistently excellent service and an all-star concierge and it's fair to say that CuisinArt is top of class. 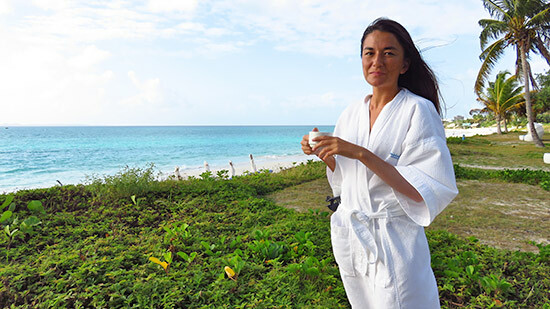 As you approach CuisinArt's signature sky-blue domes, exhale and relax. You have chosen well and are in excellent hands. We have, of course, been covering CuisinArt's many strides forward in recent years. It was time to archive our previous "total review" and experience how all these developments tie together. 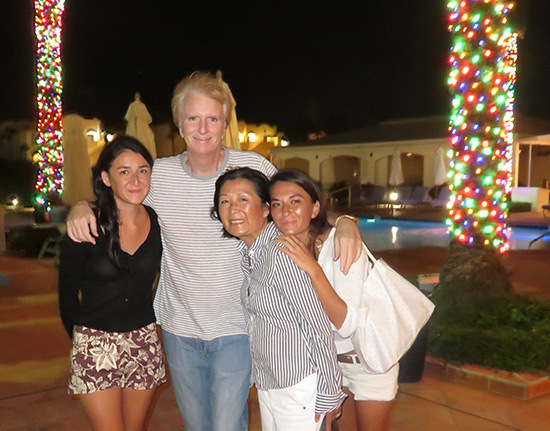 When CuisinArt invited us, the whole family jumped at taking a mini-vacation "away" (10 miles away!) from home. 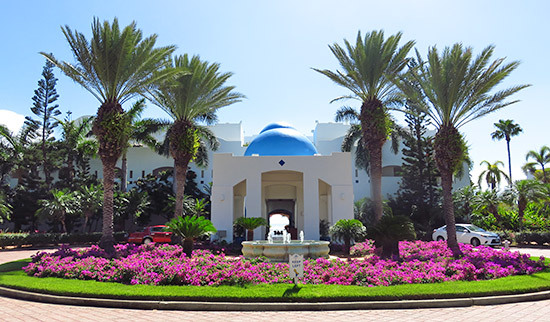 Before we get started, here is a complete video tour of CuisinArt Golf Resort & Spa. It gives you the "lay of the land" and shows you inside rooms, suites, the spa, the hydroponic garden and more. Keep reading for our family's "stay-cation." We arrived ready to relax. 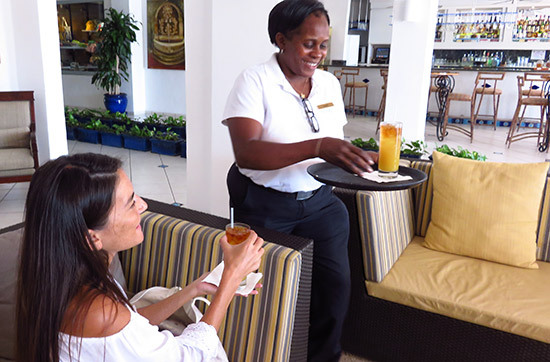 Devon welcomed us, scooping up our bags and sweeping us into the bright lobby to commence the calming CuisinArt experience. ... and Internet access is amazingly fast. Myers's rum, mixed with pineapple and Orangina! 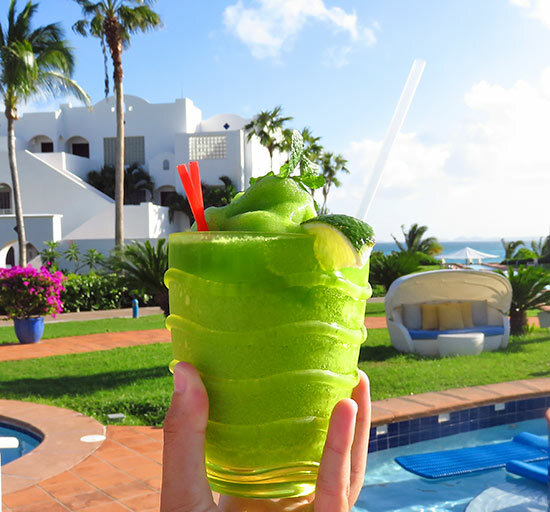 Utterly refreshing, it's a delightful way to start a stay in Anguilla, especially with the view from the lobby. As we walked the expansive property, my Dad remarked on the landscaping. 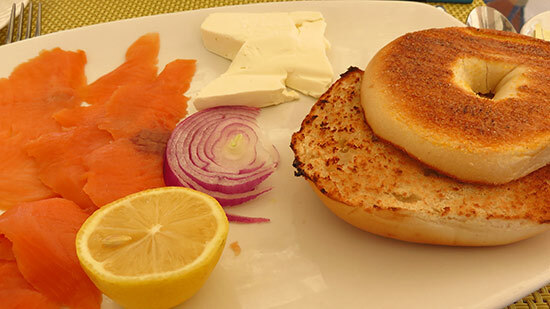 It is one of the aspects that made us all fall in love with CuisinArt on our first stay back in 2006. 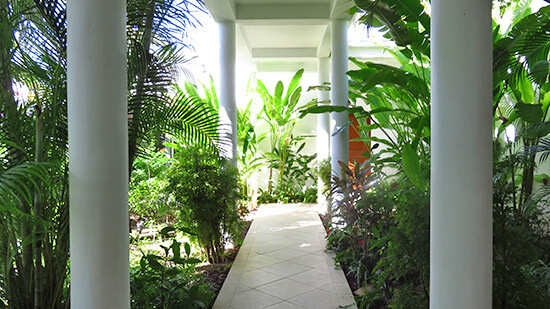 The rustling of the palms and the gentle garden aromas lend a quiet, peaceful and tropical feel to the property. 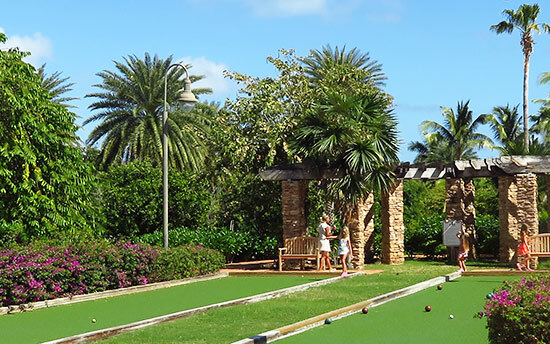 Well-manicured, the resort grounds are managed with a deep attention to detail. 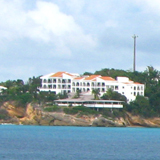 Before we moved to Anguilla (in 2008), CuisinArt became our Anguilla resort of choice. It was the luxury hotel that my over-worked parents could rely on to relax, recharge, renew. Their favorite hotel room was the Beachfront One Bedroom Suite. The views from the third floor take your breath away. The suite is complete with an oversized terrace so you can fully indulge in Tranquility Wrapped in Blue. Every square inch (1,800 square feet) of interior living space maximizes those serene sea views. The extra elevation also lets plenty of light into the suite (the room never heats up thanks to the constant air conditioning). One step inside the One Bedroom Suite, and we felt at home. 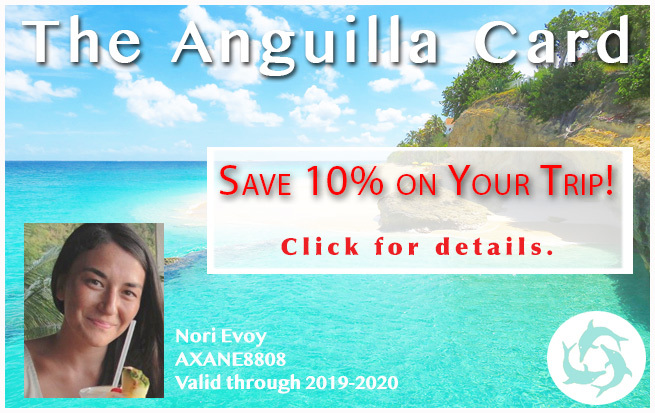 Memories of our early years vacationing in Anguilla came rushing back. It felt the same, but everything was either replaced, upgraded or totally new. Both the living room and the bedroom (with its own living area) face the water. 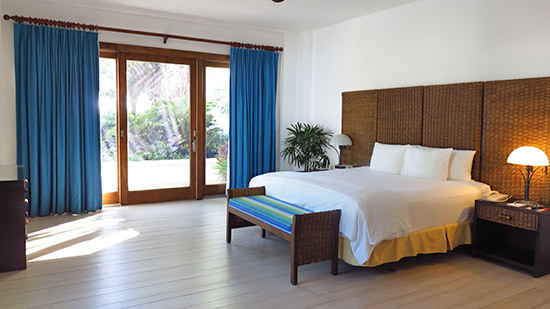 Keep the sliding doors open and the sound of the Caribbean Sea fills the room. The living room and bedroom each has a flatscreen TV, and the bedroom features a Nespresso machine (makes a great espresso!). The second aspect to the suite that my parents remembered with a great fondness? 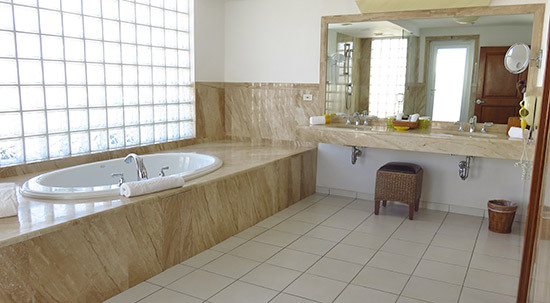 The grand ensuite bathroom. With a large sink-tub encased in marble, walk-in shower, his and hers sinks, and adjoining private sun-deck and outdoor shower, it is spacious and luxurious. It's the perfect resort suite for a family of four (request roll-away beds in the living room). Don't be upset if the younger members of your family turn to their phones to immediately Instagram the view. 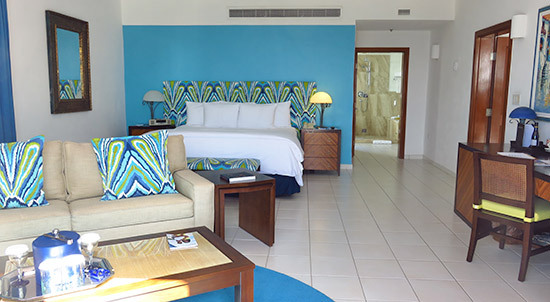 More on CuisinArt's Beachfront One Bedroom suite here. 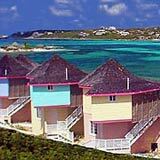 The Beachfront One Bedroom Suites are located in the resort's three-storey buildings that line Rendezvous Bay. 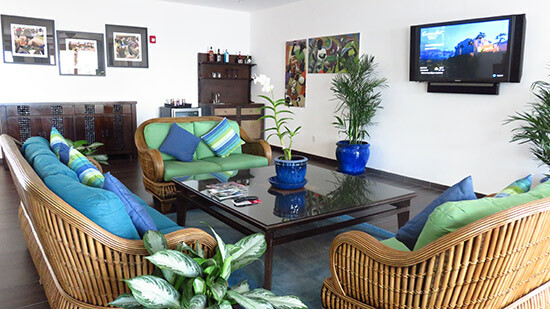 These buildings also house other suites, including Junior Suites, Deluxe Junior Suites and Two Bedroom Suites. The Deluxe Juniors and Two Bedroom Suites are located on the buildings' top floors. 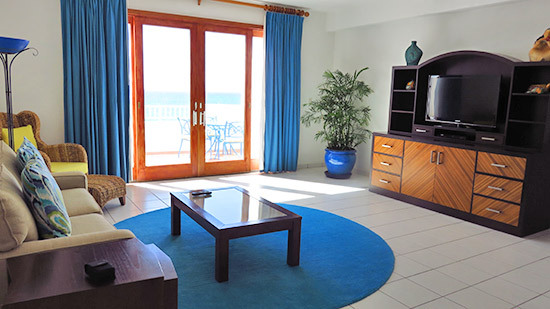 The Beachfront Junior Suites are located on the first and second levels. 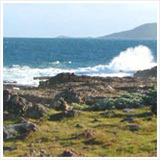 Click here to check room rates and availability. 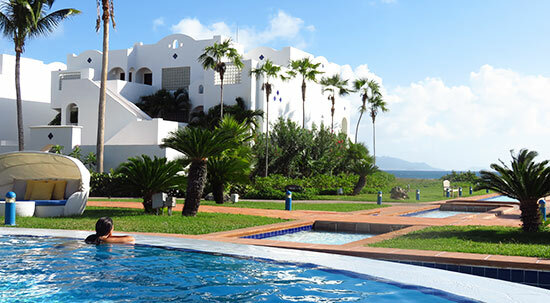 We were also introduced to CuisinArt's Beachfront Three Bedroom Villa. Their villa suites are yet one more addition to the resort since our last stay. 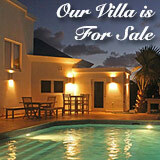 This series of villa suites (beachfront and garden villas) are tucked away on the property's east end. They range from one to five bedrooms. 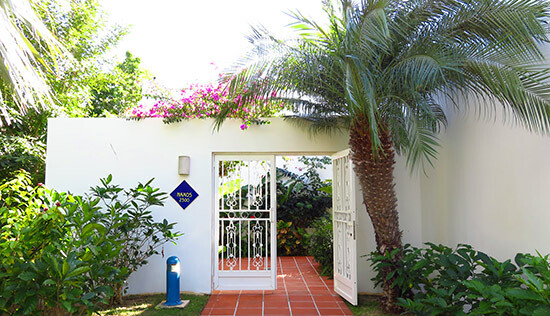 Behind gates and surrounded by lush gardens, there is an air of exclusivity within the villas on the eastern side of the property. 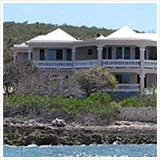 Devon opened the understated door to the main villa building, and the expansive living room. Complete with comfortable couches, a flatscreen TV, wet bar with wine fridge (it comes stocked) and even a large dining table, no living convenience has been overlooked. Cross the main room and you are on your own secluded terrace, with a warm plunge pool and outdoor shower. Most exciting of all? When Devon encouraged us to go beyond the terrace. We were right on the shores of Rendezvous Bay. 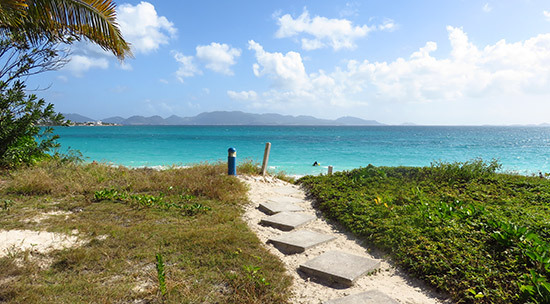 Its entire sandy stretch lies at your feet, St Martin's majestic mountains straight ahead. 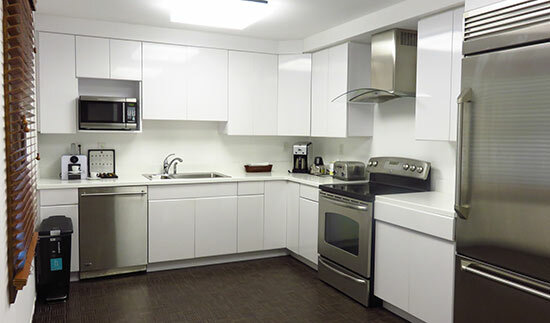 Back inside, the villa also features a full kitchen with every appliance and dish you might need for preparing meals. It comes pre-stocked with a selection of complimentary beverages (ex., Coke, Diet Coke, Sprite, Orangina, Evian, beer, etc.). 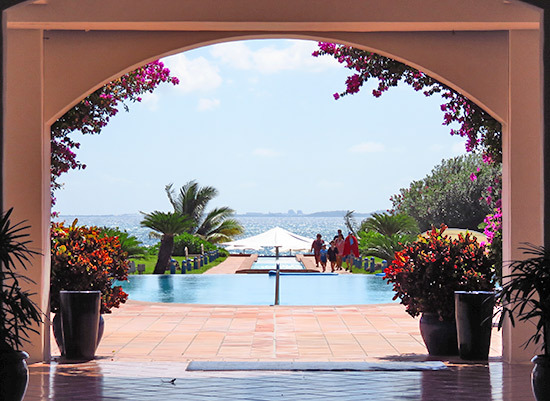 There is one luxuriously large master bedroom with ensuite bathroom (complete with a large sink-tub, walk-in shower and double sinks) with a view of the pool and the sea. 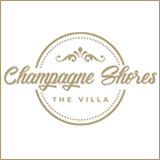 Two ample and well-appointed bedrooms are set in separate buildings in the villa's garden. There is smart reasoning for this layout. 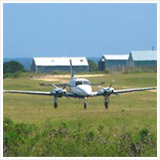 It is ideal for families with older children, multi-generation families and adult couples traveling together. 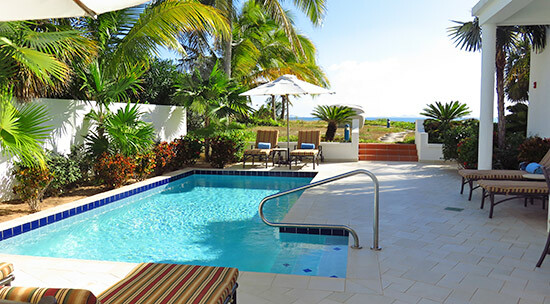 See more on CuisinArt's 3 bedroom beachfront villa suite here. 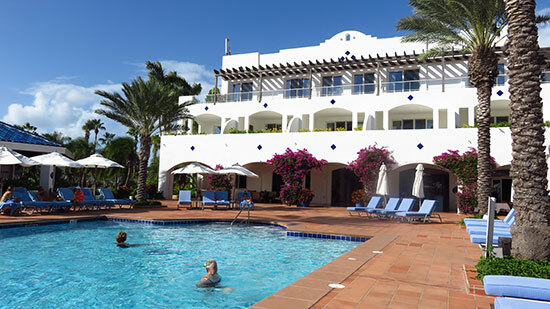 CuisinArt also offers accommodations in their main resort house. They range from single rooms to penthouse suites. "Seaview" suites and penthouses, they range in size (going up to 4,000 square feet). They are excellent choices if traveling with family members who require an elevator. 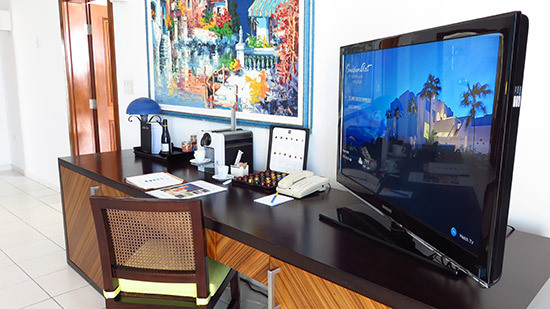 More on CuisinArt's penthouse suites here. 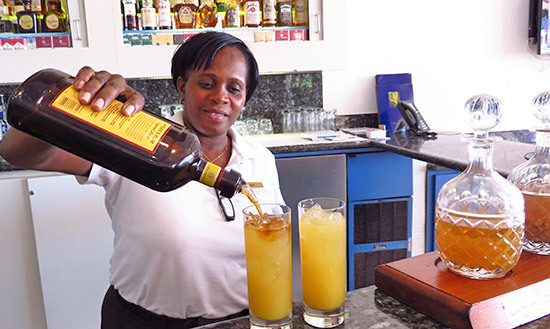 With Devon's expert tour coming to a close, it was time to settle into CuisinArt Golf Resort & Spa and let the unwinding begin! 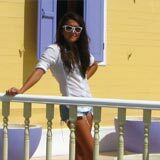 Laid-back yet professional and quick to assist, Devon was a true pleasure and an absolute asset throughout our stay. 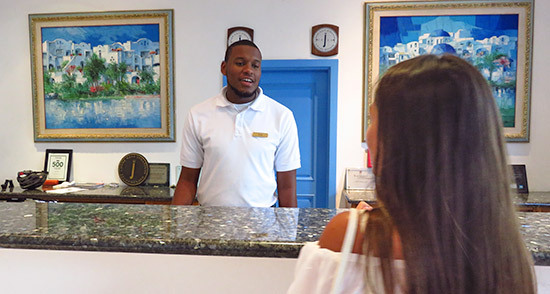 He left us with the kind and accommodating Jose, who manages the villa suites. Jose asked our preferred time for daily housekeeping, turn down service and beach chair service. He even arranged for complimentary sorbet to be sent over. And then? We were unpacked and into our swimsuits in a flash! My sister, Yuki got to work on her tan. The bowl of hydroponic tomatoes was a special surprise. I remembered them warmly from our previous stays. 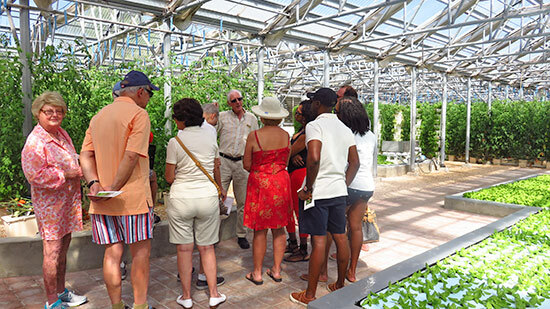 Sweet and juicy (even children love them - I speak from experience), they are grown on-site in CuisinArt's hydroponic gardens. 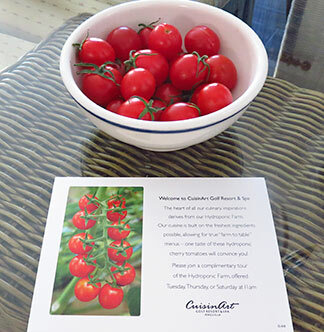 In fact, most produce used at CuisinArt's restaurants is sourced from their own gardens and ultra fresh. Dr. Howard Resh manages the gardens and provides tours daily. It's always the little touches that make the biggest difference! 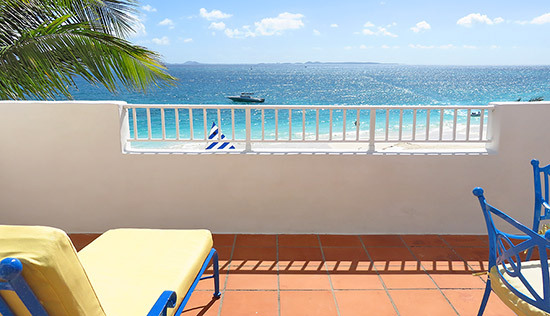 Back on the villa suite's terrace, we were beach-ready. 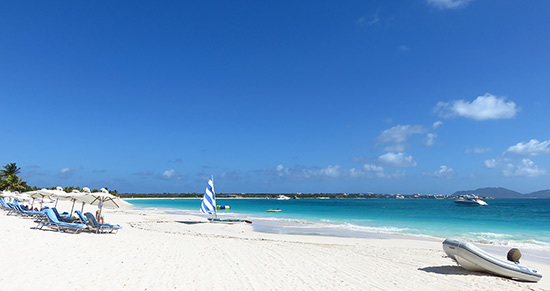 Having Rendezvous Bay right at your finger tips (toe tips?) feels like a dream. 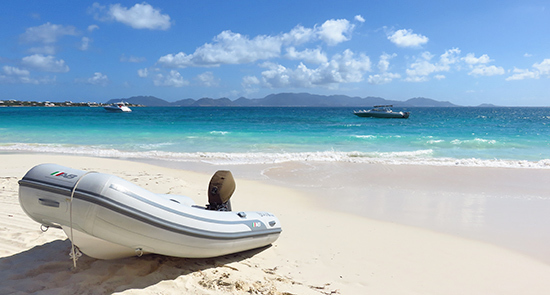 Long and smooth, with powdery-fine sand, warm, calm waters, and views to St. Martin, it's physically flawless. It also offers the best of both worlds. 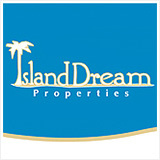 There are many quiet and undeveloped areas and the beach features some of the island's most popular bars and restaurants. 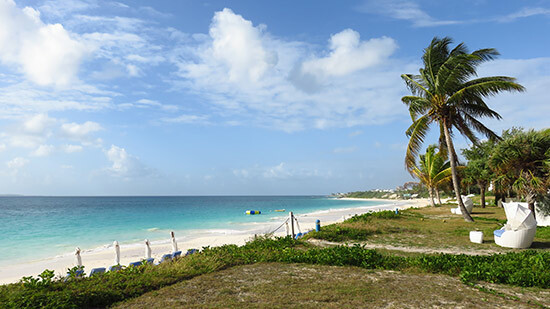 The Dune (rated #1 beach bar in the Caribbean by CNN), Garvey's Sunshine Shack and The Place are no more than a few minutes away. While my Mom and Dad walked the beach, Yuki and I couldn't resist hopping on CuisinArt's water trampoline! Bouncing over clear waters is a real blast. Situated in shallow and usually calm seas, it's safe, too. Naturally, young children should be monitored. 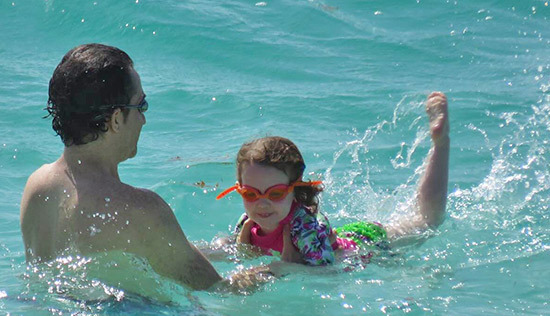 Because Rendezvous Bay is consistently calm, without big undertows or rip currents, it's idyllic for families with young children. 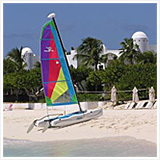 To get a little more adventurous further offshore, the resort offers several activities including snorkeling and sailing. 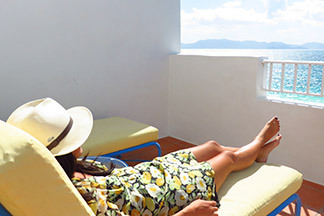 Our energy expended on the trampoline, we slipped into a dream-like state on CuisinArt's floating sun deck. 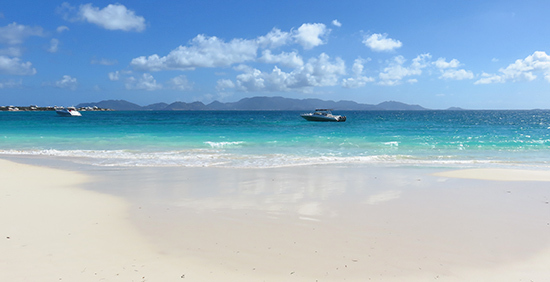 This is my new favorite spot on Rendezvous Bay. Sunning from a lounge chaise is more Yuki's style. Beach chairs already set up, the attentive beach attendant brought over more refreshing sorbet. Soon, we were napping again. Upon waking, we checked out the Beach Bar & Grill, situated right on the sand. 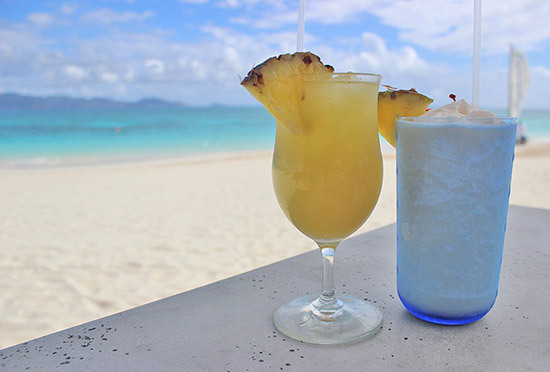 We ordered a cocktail at the bar, but you can also order drinks from your beach chair. This is luxury-beaching at its best. For some, of course, the pool will call. CuisinArt answers. 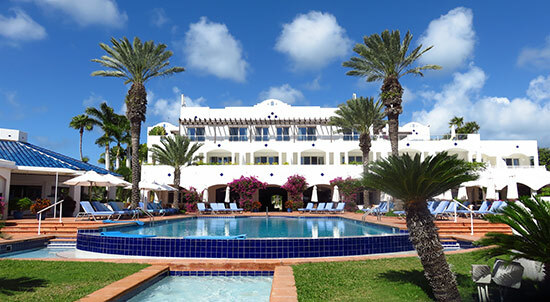 The impressive pool is set in front of the lobby and just next to Café Med in the middle of the resort's grounds. As children, the pool was our favorite part of the hotel. You will probably find this true for your kids, too. As adults, nothing sets you into a day-dreaming trance faster than gazing the length of the pool whose view drops into the Caribbean Sea. While my Mom sipped, I floated in the soothing afternoon sun. Mostly, though, I couldn't resist the infinite view. 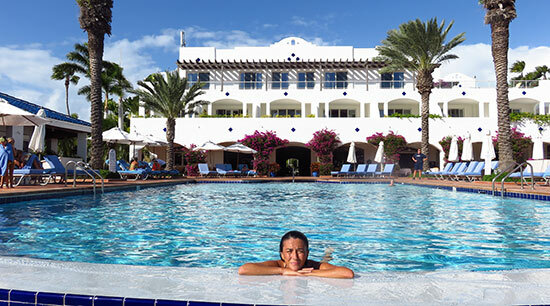 Protected from the tradewinds, the pool is always warm. 3pm is one of the best times for a swim, when the sun is lower in the sky and lighting up the eastern chairs face-on. Mid-afternoon turned into early-evening all too quickly, and soon it was back to the room. With Day 1 already drawing to a close, the dark night sky swept over the resort, St. Martin's lights dazzling in the distance. Stomachs rumbling, it was time for dinner. 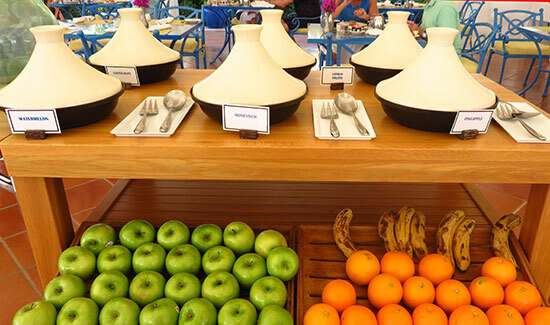 CuisinArt is home to the best resort dining on the island. It goes beyond "resort dining," though. Its restaurants belong in any "best of" list. As day moves into night, you will also find nightly live music (provided by Director of Entertainment, Michael Masci) and a variety of dining activities (including cooking classes and wine tastings). Chef Jasper is passionate about his craft. He lives to delight your tastebuds with his gourmet preparations. He succeeds in that goal in a non-intimidating, even light-hearted atmosphere. Warm and down to earth, his personality shines through in the memorable dining experiences he creates. We dined at my Dad's favorite, Le Bistro at Santorini, this is also the restaurant that's nearest and dearest to Chef Jasper's heart. We put ourselves completely in his hands with his Chef's Tasting Menu. We knew we were in for an exquisite culinary experience when Chef Jasper clapped his hands together and said, "Let's have some fun!" 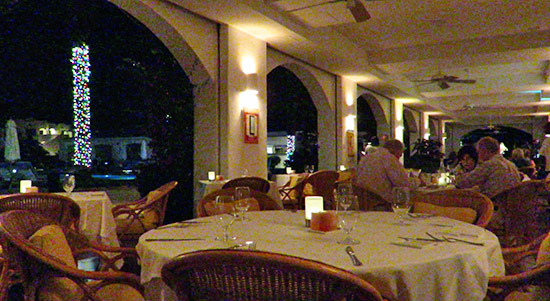 Simply unforgettable, dinner at Le Bistro at Santorini is a must for all visitors to Anguilla. 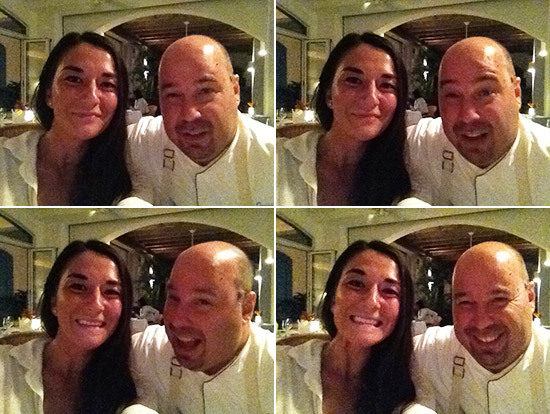 Chef Jasper is a highlight of staying at CuisinArt and one of Anguilla's hidden gems. 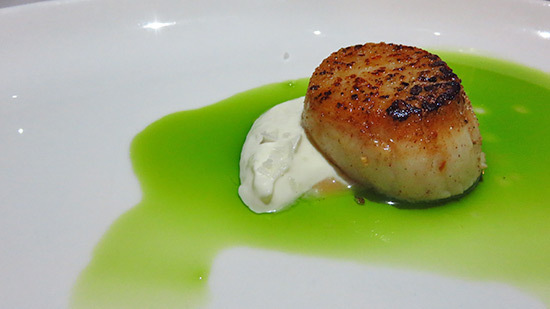 More on Chef Jasper's Tasting Menu. 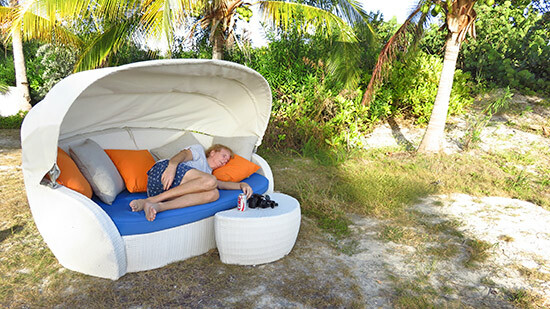 Under CuisinArt's cool comforters, we slept soundly, lulled to sleep by the waves and awoke the next morning ready to dine again. 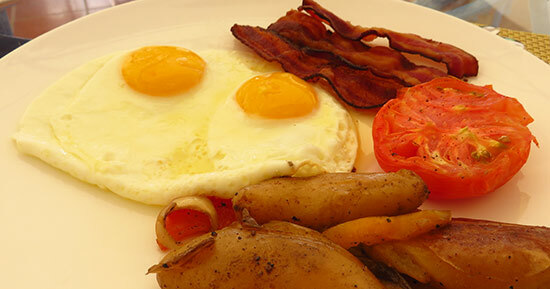 This time at Café Med for breakfast. 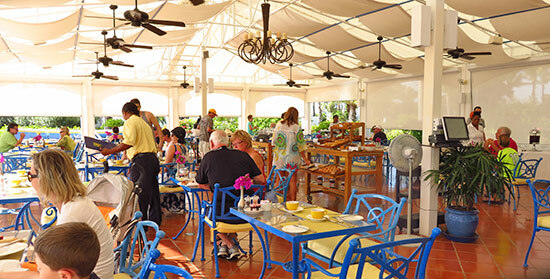 Under Café Med's airy, white tent, breakfast is served daily. 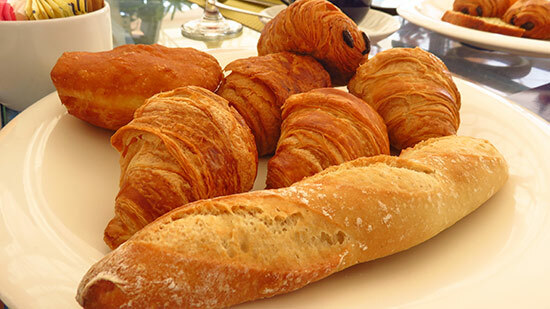 The options are endless when it comes to the Continental Breakfast. 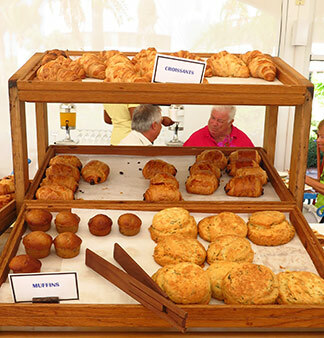 Chocolate croissants, regular croissants, scones, muffins, danishes, even mini-baguettes (possibly the best baguette in Anguilla!) and Johnny cakes! The presentation is charming, reminiscent of the south of France. ... and a variety of yogurts and add-ons, including granola. You can also kick start your day with a blended juice or smoothie made with soy milk, whole milk or skim milk. These were the offerings that called to us loudest. Luckily, CuisinArt offers plenty of ways to stay in shape! 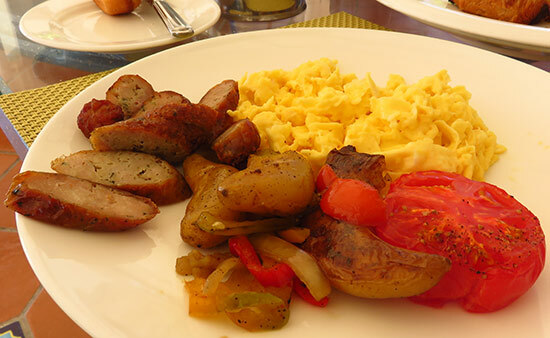 By Day 2 of our weekend stay at CuisinArt, we were into a solid routine. Pool. Eat. Beach. Sleep. Repeat. It was time to break the habit and work off at least part of breakfast. Our options? ... and most popular of all? 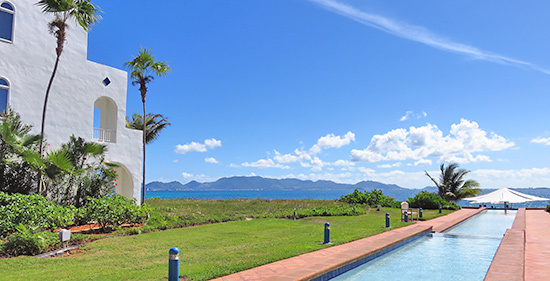 Spa by CuisinArt, Anguilla's leading spa, and CuisinArt Golf Club, the Greg Norman PGA course that is amongst the best in the Caribbean. Yuki and I started light with shopping! That counts, right? 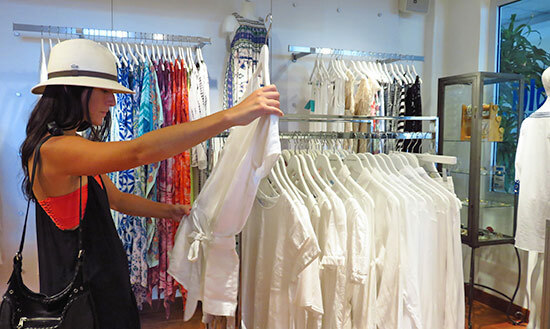 ... carries a variety of Anguilla-ready clothing, including Vilebrequin for men and trendy brands like Melissa Odabash for ladies. 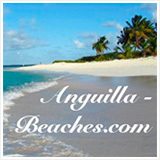 With tasteful swimwear, beachwear and tropical wear, their selection is spot-on. 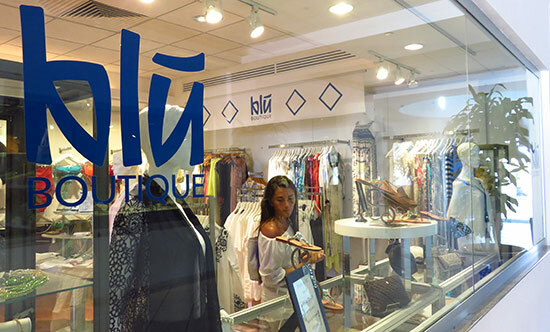 Dedicated to our "work out regime," we popped over to the boutique across from Blu Boutique, Alberto e Lino, too. 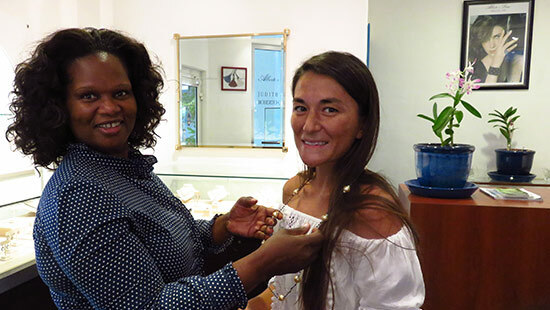 They carry high end jewelry, including La Campanina from Capri, exclusive to CuisinArt. Rosie Connor, the boutique manager, is a wonderful host. The resort also features a small Sundries shop, carrying all of the essentials (ex., flip flops, sunscreen, etc.). 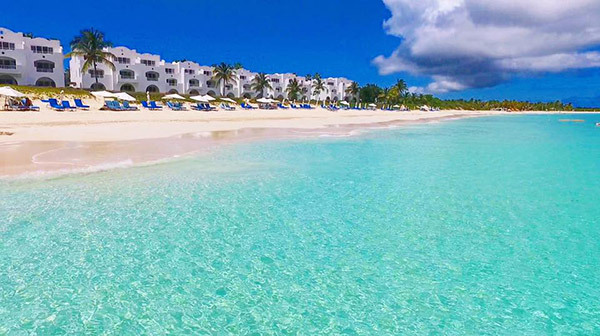 Even though we live in Anguilla, this really was a mini-vacation for us. Before we knew it, Day 3 was upon us and check-out time loomed. 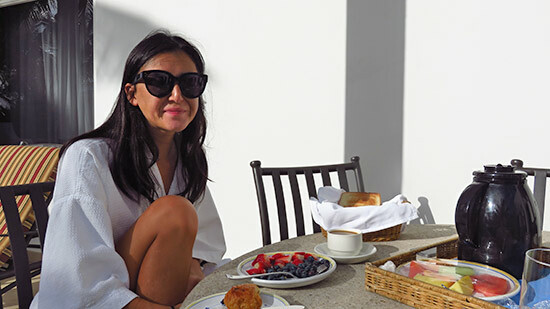 We enjoyed breakfast in the peace of our suite and tried to soak in every last minute. 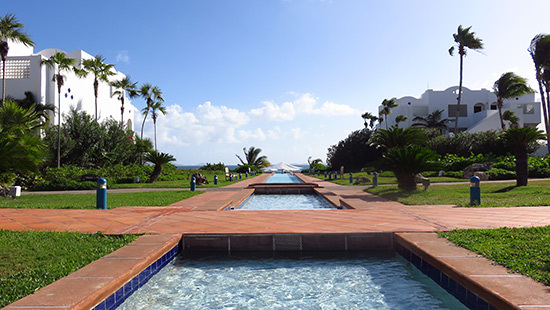 They say "all good things must end," but memories made at CuisinArt last forever. ... all with the rhythm of the waves washing over you. When time comes to leave CuisinArt, you do so rejuvenated and refreshed, reminiscing on good times past and already looking forward to those that lie ahead.